This past weekend has been a fruitful one in terms of getting involved with the multitude of models I have, including the ongoing Heldrake and Possessed Marine kits. I started a new kit from my latest purchases and did some testing on the winged Possessed Marine. Find out more after the jump. As I mentioned before in my earlier posts, a fellow hobbyist and I try to come together in a joint workshop where we set up an airbrush booth and light box for the models. This weekend was one of these modeling sessions we held. Currently he and I are working on a special project other than our pieces for the competition in May. …but a little stuffy after heavy spraying! That’s right, these little rascals will be my parallel project for the time being. 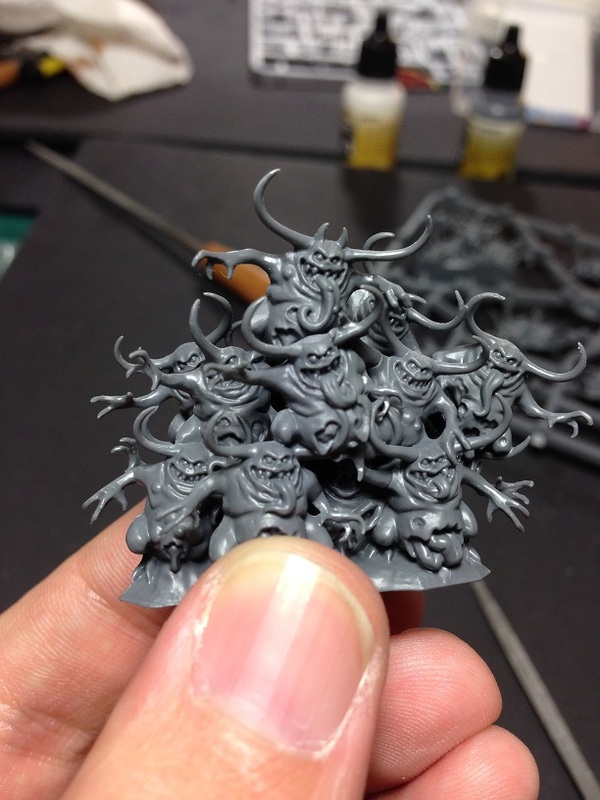 I find that after priming the Heldrake and mostly readying it for painting, I can get the luxury of having concurrent projects along with it, such as my Possessed marines and maybe one other kit… and that kit is the Nurglings! They’re so small and brittle! Line running down the side of the body. No big deal. Line running INSIDE the model. Now that will be a pain to clear. Another line runs down the arm. 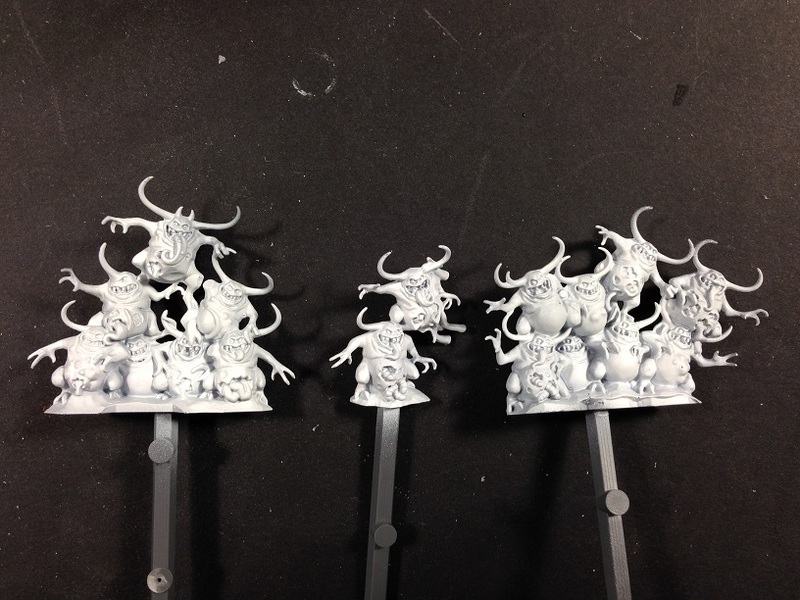 Mold lines also run across the horns. The tool doesn’t warp the surfaces during cuts either! 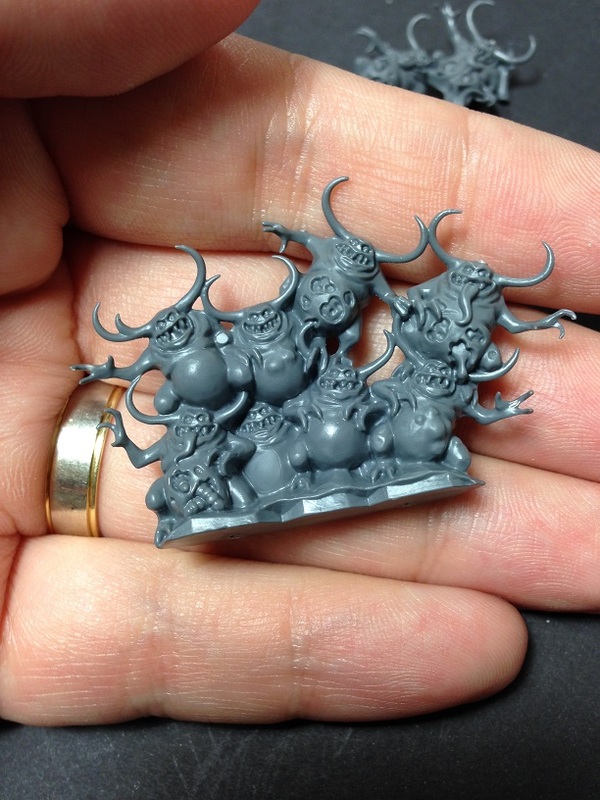 It took me about 1 hour to fully clean up the mold lines all around the pieces that come together into one mountain of Nurglings. So at this rate it should take me an extra 2 hours to get the remaining two mountains of demons. The tiniest parts were a bit difficult to move my blade around so I alternated between the emery boards I purchased and a modeling file my buddy lent me. The coarse emery board fits in just right. 3 rows come together into one heap of demons. The rows do not cover the entire base when assembled, so some modification in the back or front is possible if wanted. 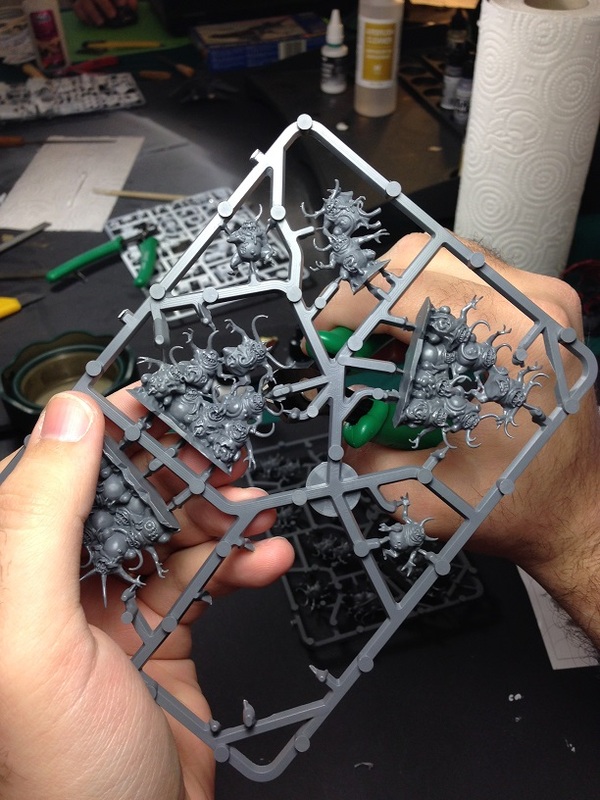 The sprue also has some spare Nurglings that are independent from the rows that allow some customization (or use in other kits). It really leaves a lot to the imagination. After full cleanup I cut off some straight pieces off the unused sprue and sanded the top surface of each. 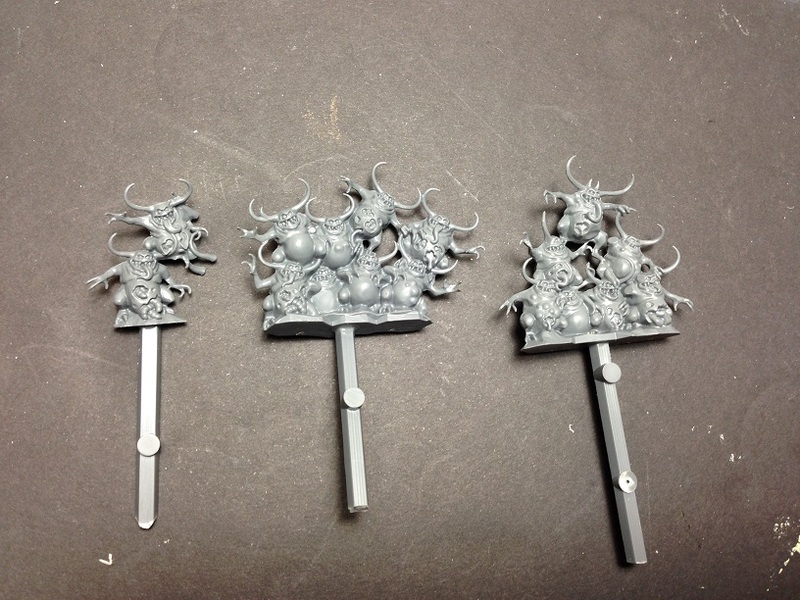 Then I glued these to the bottoms of the rows to create a makeshift spray stick for the priming. Another option would have been drilling a hole and pinning the pieces on cork pieces, but I did not bring my drill with me for that day. This will be handy especially when using white primer. A little fiddling with the airbrush and some VMA White primer, the pieces are ready for painting. In my previous post Greggles from Feed Your Nerd suggested using purple for the wing membrane, and I wanted to give it a try. The color I have is the old series GW Hormagaunt Purple of the Foundation paints, and it covered the poorly brown-painted wing beautifully. I also fixed the left wing with a second coat of brown (still not impressed) and applied an Agrax Earthshade wash. Needless to say, the effect is either very subtle on the left or I just can’t see it. One last effort will be applying a very dark brown to create high contrast with the red arms. The purple created a very interesting effect, but reminds me a lot of Slaanesh aligned demons so I’m still not entirely convinced. I might try something darker there too with a touch of black. Now I have 4 parallel projects (one still waiting for lift-off) that should give me some variety on this space. Each is different enough to keep me entertained and motivated to chronicle here, so tune in for more updates! Agree the purple color is a bit too cool for the khorne style possessed. Maybe a pink horror/emperors children highlight? Purple’s a very interesting color, as it can go both spectrum s (cooler or hotter). Always hard to get an idea of what it looks like until you put it on the model. I’m thinking a grade of orange might work better on the possessed looking at how the purple is changing it. That would actually be a great complement, since I’m planning on highlighting the flesh with tones of orange. Can’t wait to pick up the brush again to try this out!